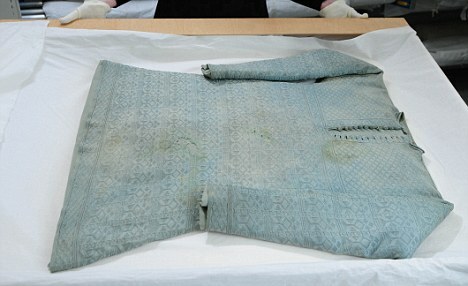 Was this the waistcoat that Charles I was wearing when he was beheaded? On Tuesday 30th January 1649, a bitterly cold day, King Charles I was beheaded outside the Banqueting House at Whitehall Palace. His last words were, "I shall go from a corruptible to an incorruptible Crown, where no disturbance can be." This occurred during the English Civil War (1641-1651), in which Parliament fought the Monarchy in a series of bloody battles. The Monarchy was defeated and England became a republic. King Charles I, the son of King James I, was declared a traitor and subsequently beheaded - the only English monarch ever to have been executed. Soon after, England became a republic and a dictatorship under Oliver Cromwell. But what the king actually wore during his execution has been something of a mystery. But hopefully the answer is soon to be revealed. Charles is said to have worn two shirts for his final hours on account of the bitterly cold weather in London; the king was keen not to be seen shivering in case onlookers interpreted it as fear. However, experts have long believed that a stunning light blue knitted silk waistcoat was, at the least, the over-garment. And experts are hoping to prove that undated stains on the waistcoat, visible only under ultraviolet lights, are blood splashes left from the public killing of the former king. When the sword struck the king's neck, "such a groan" reverberated through the watching crowd. The spectators then dipped their handkerchief's into his blood as there was a belief at the time that a king's blood could cure illness. 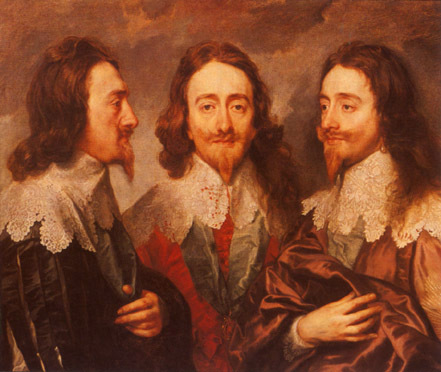 Historians are hoping to use modern DNA testing to finally crack the mystery of what Charles I was wearing when he was beheaded at Banqueting House in the 17th century. However, experts have long believed that a stunning light blue knitted silk waistcoat was, at the least, the over-garment. 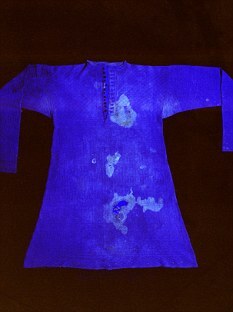 They are hoping to prove that undated stains on the waistcoat, visible only under ultraviolet lights, are blood splashes left from the public killing of the former king. Primitive tests run in 1959 and 1989 by the Metropolitan police Forensic Society were only able to confirm the stains were bodily fluids. The waistcoat has been the Museum of London's 'number one' artefact since its donation in 1925. Hilary Davidson, Curator of Fashion and Decorative Art, said: 'If the new tests are able to conclude it's blood then there will be little doubt left. 'It's nearly impossible to prove 100% that this is Charles' execution waistcoat but there are several important pieces of evidence suggesting it was. All we can do is try to build on the evidence we have and use new techniques to seek out new information. 'We have a provenance that came with the coat with dates that exactly match the history we know. 'There are also paintings showing Charles wearing a similar coloured garment that matches the style and several written accounts of him wearing a silk blue waistcoat. A convincing note of authentication - the provenance - detailing its owners since the execution was attached to the item during a private sale following Charles' death. It told how it came into the hands of Charles' private physician who attended the beheading. It read: 'This Waistcoat was worn by King Charles the First on the day he was Beheaded and from the Scaffold came into the Hands of Doctor Hobbs his Physician who attended him on that Occasion, The Doctor preserved this Relic of his Royal Master, and from him it Came into the Possession of Susannah Hobbs his Daughter, who married Temple Stanger of Rawlins in the County of Oxfordshire. King Charles I was born in Dunfermline in Scotland on 19th November 1600, the son of King James I (VI of Scotland) and Anne of Denmark. Charles became king in 1625, aged just 24, following the death of his father. After a weak, sickly childhood, he became an excellent horseman and a strong-willed king. His strong will, however, proved to be his undoing: mismanagement of affairs (in the tradition of his father) forced a showdown with Parliament, which culminated in Civil War and his execution. 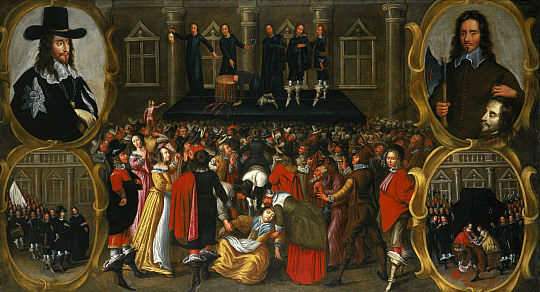 The beheading of Charles I, commonly believed to have happened on 30 January 1649, followed a trial from treason and remains the only execution of an English monarch in history. It was the act of a small and reluctant minority of English parliamentarians who opposed the right-thinking views of the majority. Mystery surrounds a number of aspects of the king's death, most notably his choice of clothing and the identity of the axeman - the original executor having pulled out at the last minute. At one point in the 20th century three people laid claim to possessing the top Charles wore when he met his end, but only one contains stains likely to be blood. The incident was depicted in stunning form by Sir Alec Guinness in the 1970 film 'Cromwell'. The waistcoat was subsequently owned by relatives of Temple Hardy until 1898 when it was sold at auction by the last of the family line. It achieved a sale price of 200 guineas (£210), 'not an exorbitant price', one writer thought at the time, for 'a relic at once authentic and ghastly'. This 'combination of Royal associations with gruesome memories' would prove 'quite irresistible' should the garment again appear on the market. It did so in 1910, changing hands for the same price. Mr and Mrs ES Makower purchased the garment in 1925 for presentation to Museum of London (then the London Museum) where it has been kept ever since. The English Civil War - which was actually fought not just in England & Wales but also in Scotland and Ireland - was a bloody affair. In England (including Wales), 190,000 people - including both soldiers and civilians - were killed. Scotland, with a much smaller population, probably saw around 60,000 people killed. An incredible 618,000 people were killed in Ireland, thousands of whom were murdered by Oliver Cromwell's republican Roundheads. The deaths equate to 3.7% of England's population, 6% of Scotland's population and a mind-boggling 41% of Ireland's population. To put that into perspective, Ireland lost 16% of its population during the Great Famine in the 1840s and so did the USSR during World War II. The execution following the King's trial took place on a temporary scaffold erected outside the Banqueting House in Whitehall, at first floor level. A huge crowd gathered to witness the event, but they would have seen practically nothing of the killing because the scaffold was so high and a solid regiment of troops was stationed around it. The King's body was removed and buried secretly in Windsor Castle without any religious service. 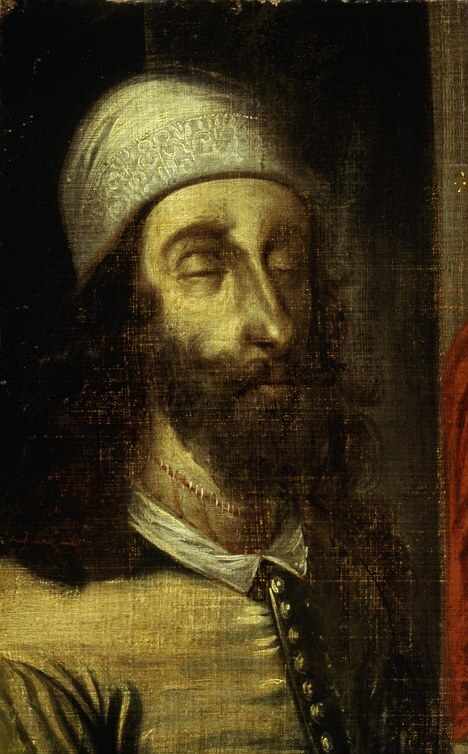 His corpse was undressed and his clothing distributed to people at the execution, including Charles' physician, who allegedly obtained the waistcoat. Portraits, records and descriptions confirm that Charles wore rich and fashionable dress in the earlier days of his reign, in line with his status. His personal taste is said to have been modest and by his last years it is likely that his wardrobe became less flamboyant. 'Some accounts suggest that Charles asked for this waistcoat to wear over a shirt at his execution to keep him warm. It was a cold day in January and he didn't want to shiver fearing that onlookers might think he was afraid,' added Hilary. 'One of the most striking features of the garments is the lack of any heavy staining that perhaps would have been expected after being worn during a beheading, especially around the collar. 'The arterial blood released after decapitation would have spurted forward with considerable force. The new tests will begin later this year. Charles I was executed on a Tuesday 30th January 1649. It was a cold day. Charles was allowed to go for a last walk in St James’s park with his pet dog. His last meal was bread and wine. However, there was a delay in his execution. The man who was to execute Charles refused to do it. So did others. Very quickly, another man and his assistant was found. They were paid £100 and were allowed to wear masks so that no-one would ever know who they were. It is said that when he was beheaded a large groan went up throughout the crowd. One observer in the crowd described it as "such a groan by the thousands then present, as I never heard before and I desire I may never hear again." Even in death, Charles found no dignity. Spectators were allowed to go up to the scaffold and, after paying, dip handkerchiefs in his blood as it was felt that the blood of a king when wiped onto a wound, illness etc. would cure that illness. On the 6th February, 1649, the monarchy was abolished and England became a republic. What became known as a Council of State was set-up instead of the monarchy and Oliver Cromwell was its first chairman. But the monarchy was restored in 1660, with the coming to the Throne of King Charles II. Charles II wanted revenge on the killers of his father, even though many were already dead. Symbolically, this took place on 30 January; the same date that Charles I had been executed. His body was hanged in chains at Tyburn. 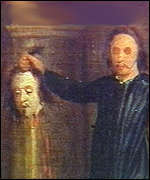 Finally, his disinterred body was thrown into a pit, while his severed head was displayed on a pole outside Westminster Hall until 1685. Ironically the Cromwell vault was then used as a burial place for Charles II’s illegitimate descendants. Last edited by Blackleaf; Feb 18th, 2010 at 02:50 PM..
Re: Was this the waistcoat that Charles I was wearing when he was beheaded? We all have to go sometime. Shucks, huh? Until I began to watch Tudor I realized that the Royals were barbaric but at the same time very sophisticated in their day-to-day affairs.